Do what you love and the success will follow. Such a simple message has inspired many to take career risks in the name of passion. The pursuit looks different for each of us, but all would agree that Aude Lemordant is on the right path. Born on May 1st, 1982 in Grenoble, France, Aude quickly fell in love with the world of aviation. Her time in the air started at the helm of a glider tug. Before long, Aude had earned her private pilot’s license. Then the real fun began. After graduation from ENAC (Ecole Nationale de l’Aviation Civile – National School of Civil Aviation), she joined Air France at 21, becoming an airline pilot on the Airbus A318-321 family at just 22 years of age. Her dream of becoming a professional pilot was realized, but Aude had already set her sights further ahead. In 2005, Aude began aerial acrobatics competitions. By 2009 she’d joined the French team and two years later she’d win the French National Championship. Aude’s roster of victories would achieve new heights in 2013 when she won the FIA World Championship in individual, freestyle, and team categories. In 2015, she took home the World Championship title again. Aude can’t seem to get enough time in the cockpit. As a full-time Air France pilot and year-round acrobatics competitor for the Breitling team, she is the embodiment of career passion. Needless to say, when the opportunity to interview Ms. Lemordant presented itself, The Manual was eager to learn more. MilesPerHr: Did you dream of being an airline pilot before showing an interest in aerobatics? Aude Lemordant: I enjoyed flying so much that I first thought of making it my job so I could fly as much as possible. That led me to aerobatics because as part of the training to become and airline pilot you train in an aerobatic aircraft. MPH: What are some of the differences between flying an airliner and competing in a world-class acrobatics competition? Aude: All aircraft, whether it is a very heavy one or a sport aircraft, are flying according to the same rules. They just have different purposes and you fly the aircraft according to its certification and capabilities. For instance the Boeing 777 carrying passengers can take off with a weight of up to 350 tonnes, with a wingspan of 65m – so it’s a completely different experience when it’s just you in your aerobatic aircraft weighing only 800 kg! My Extra is so much more maneuverable, the roll rate is 420 degrees per second – I wouldn’t even think about trying to roll a 777! The aerobatic aircraft is so much more reactive than the airliner, when I am flying passengers on the 777 there is much more inertia, I need to anticipate much further in advance, and be smoother on the controls. MPH: What’s special about flying the Breitling Extra 330SC? Aude: It is like a Formula 1 car, but in the air. It is an aircraft with a very wide flight envelope, which allows a huge range of maneuvers. I just love seeing the earth from different positions, trying new maneuvers and having this feeling of knowing the aircraft by heart. I remember the first time I took off in an aerobatic aircraft, I was up in the air before I had time to set it to full power! MPH: How many acrobatics competitions do you compete in each year and how do you prepare? Aude: I usually compete in two. The French nationals and the international competition (one year the Europeans, the other the Worlds). The rest of the time I fly at airshows, and on the airliners. The best preparation is flying, training and training. Then you also need to be in good physical health! Golf is a great sport to help train you mentally as well as physically, so I try and play as much as I can. MPH: What does it takes to be a world-class acrobatics pilot? Aude: I think the same as any kind of sport when competing at the highest level. You have to stay motivated, because it is a huge investment. You have to set goals but be prepared to adapt them. MPH: Apart from winning the World Championship, what has been the highlight of your acrobatics career? Aude: I was lucky to have exceptional people to teach me how to fly and train me in aerobatics. I have flown in many different places in France, meeting lots of great people who have supported me over the years. MPH: If you could go back in time and start your flying career all over again, would you do everything precisely the same, or were there opportunities to get to where you are now faster or via a different path? Aude: I started working as an airline pilot when I was 21 so it is very difficult to start younger than this! And in aerobatics competition I became the Unlimited World Champion participating in 4 World championships twice. I think I could not have done it faster. I believe this was the best path for me to achieve my goals. But, of course there are so many other things that I could have done in aviation such as become a fighter pilot, for example. MPH: Are there any individuals in the competitive aerobatic world who you especially admire? Aude: I admire Catherine Maunoury. She was the aerobatic World Champion and then 10 years later became World Champion again after having two children! Now, she works hard to preserve and develop vintage aviation and airplanes. She is director for the Museum of Air and Space in Paris, which is one of the biggest in the world. 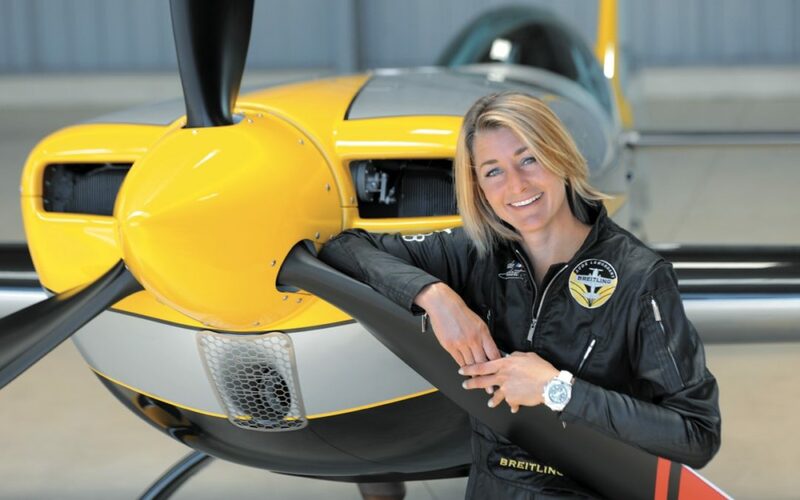 MPH: What does the future hold for Aude Lemordant as an airline pilot and an aerobatics pilot? Aude: The good thing is that I don’t know! I like to take it as it comes!